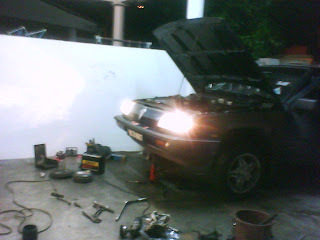 ~coz the memoirs is ours to share~: BreakDown..
this is the car my hubby exchange my PESONA with..
an old PROTON WIRA. He said its convenient..NO! He never discuss it with me.. WEIRD !! Unfortunately everything doesn't seems right at all with this car..tot!